You make these with storebought ground flax and almond flour, but you can also grind your own in a food processor or high speed blender. They are very versatile. As long as you keep the flax base the same, you can vary the nuts and flavorings as much as you like. I have even made 'cookie' versions of these with graham cracker or ginger snap spices and concentrated liquid sweetener instead of the savory ingredients. Mix all the dry ingredients in a bowl. Add the wet ingredients and mix with a fork until all the dry material has been absorbed. Let the dough rest for a minute or two to firm up. Preheat the oven to 150 C / 300 F. Cut two pieces of parchment paper to the size of your oven rack or baking sheet. Turn out the dough onto one of the parchment paper sheets and flatten it a bit with your hand or the back of a large spoon. Cover it with the second sheet op parchment paper. Use a rolling pin or glass bottle to roll out the dough between the two paper sheets. When you're done you should have a large rectangular piece of dough of about 2 to 3 mm thick. Make sure you roll it out evenly so the edges are not too thin. Remove the top sheet of paper and divide the dough into crackers with a knife or pizza cutter. Use a fork to prick some holes into each of the crackers. Transfer the paper with the crackers onto your oven rack or baking sheet. Bake the crackers for about 20 minutes until they are firm. Watch that they do not brown, because that ruins the taste. When they are done, turn off the oven and leave the crackers in their for hour or so with the door closed, so they dry out and crisp up a little more. Once they are completely cooled, store in an airtight container. This way they will keep at least two weeks, if you don't eat them long before then. The whole recipe has about 1620 kcal, 122 g fat (13 g saturated), 26 g net carbohydrate, 63 g fiber and 82 g protein. What’s the serving size? How many servings does this make? Hi Meg, you can choose your own serving size. When I eat these, I get about 10 servings from this recipe. You can also calculate the carbs per serving by dividing the total amount of carbs by the number of servings. Brilliant, easy recipe! 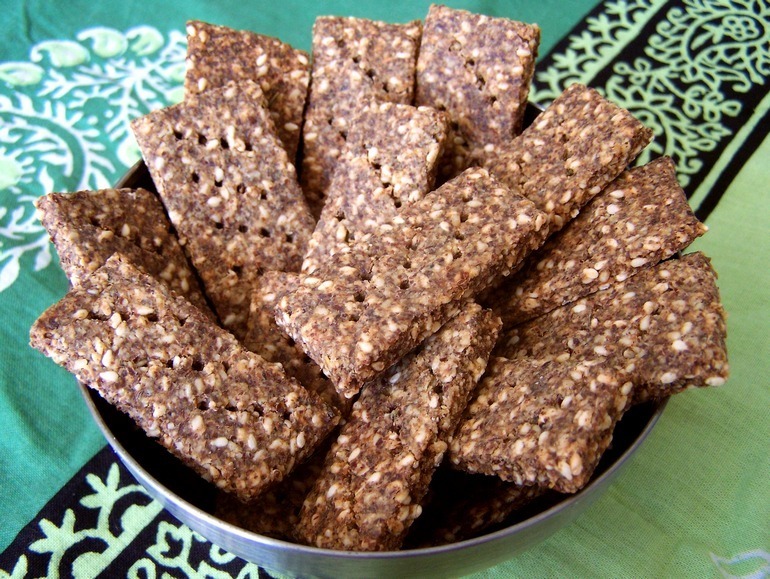 These crackers are so healthy & delish. It’s fun to vary the recipe with seasonings & seed choices. Store-bought crackers are chock full of carbs & unhealthy ingredients even the so-called healthy alternatives. Glad you like them Polly!